Testimony presented to the House Energy and Commerce Committee, Subcommittee on Digital Commerce and Consumer Protection on February 14, 2017. 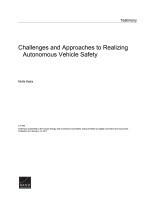 Kalra, Nidhi, Challenges and Approaches to Realizing Autonomous Vehicle Safety. Santa Monica, CA: RAND Corporation, 2017. https://www.rand.org/pubs/testimonies/CT463.html.